The life of Victor Jara became a symbol of one of the most important experiences of the twentieth century. This was the creation of a movement to achieve the possibility of a new kind of democracy, in which the poor could participate fully to change their lives for the better. Victor Jara’s music brought out the beauty of that experience for Chile’s workers and peasants. He is celebrated still with great fervour in his home country. Across the world there are people who have found that he symbolises the vision that they share with his compatriots, arising from quite different national and cultural experiences. That is the origin of this festival on 22nd-24th July 2005 in Machynlleth at the heart of the Dyfi Valley in Wales. We have no doubt that people will enjoy the music, dance, poetry and theatre of the festival. Here we want to describe what we think lies at the heart of the vision that inspired us to organise it, so that we can share that too. Why should a great theatre director, songwriter, singer and musician be tortured and cruelly executed by a military dictatorship immediately on taking power? What kind of terrorist was this? Why should the government be supported in its actions by the most powerful nation in the world, which has always claimed to promote freedom and democracy? It is because these questions are still relevant today that the life and work of Victor Jara should continue to be celebrated. He was born in a remote village, where his father had a tied cottage as an inquelino, a labourer on a latifundia or semi- feudal landed estate. It was a life of poverty and marginality. As so often in peasant families, only the efforts of his mother, after his embittered father became drunkenly violent and useless to the family, opened up a different future for Victor. She took her children to the slums of Santiago where her sheer hard work enabled him to start an education, whilst her own love of singing traditional music inspired his interest. Among the leading figures of the Chilean democratic movement he was one who shared the origins of the poor who supported it. Victor’s artistic talents were first recognised when he joined a semi-voluntary theatre mime group. This led to training as an actor and director in the theatre and his innovative work in this field led to national and international recognition. However from an early stage in this period he became involved with others who were collecting and learning peasant folk music and re-interpreting it with increasing popularity. Although his theatre work was similarly informed it was as a singer and musician that he developed his role as a voice of the democratic movement, along with groups like Inti Illimani and Quilapayun. In the late 1960’s the same poverty, injustices and aspirations that led to the Cuban revolution were apparent in other parts of Latin America. Workers and peasants in Chile had a history of political organisation and the Chilean Popular Unity Movement chose the democratic road to socialism. When Salvador Allende, leader of the Socialist Party was elected by its people Chile became a beacon of freedom for the poor and dispossessed elsewhere. Chile was showing the world that people might choose socialism by a democratic process and not just by military success against foreign rule or dictatorship. Because this was a new culture of democracy people combined political participation with involvement in music, dance, theatre, and the visual arts. 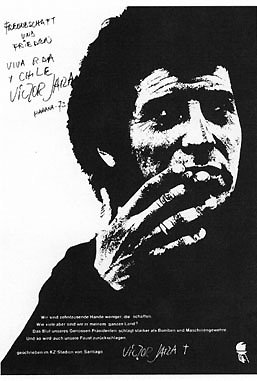 The New Chilean Song movement of Victor Jara and others, incorporating traditional instruments and forms along with new music that expressed peoples’ contemporary lives and aspirations, replaced the products and promotions of international record companies in the popular charts. Popular culture lived up to the label. September 11th 1973 saw the end of all this. A military coup led by General Pinochet removed the democratically elected government. The President Salvador Allende was killed in the bombing of the Presidential palace. Thousands of active supporters of the Popular Unity government were arrested, imprisoned in the National Stadium and in many cases tortured and murdered. Among these was Victor Jara.We have direct evidence of how he was cruelly beaten, his hands mutilated as his tormenters mocked that his days as a people’s musician were over, and finally murdered. His death silenced his voice but the manner of his death also spoke eloquently for thousands of other democrats tortured, killed and “disappeared” under Pinochet. In Britain Margaret Thatcher was a close friend of General Pinochet and leading politicians supported him when he was awaiting extradition to Spain for a proper trial. On the other hand Chilean democrats applauded a British Home Secretary who agreed to his extradition.Others responsible for the regime’s atrocities have recently been indicted including the officer accused of Victor Jara’s torture and murder. It is to be hoped that the divisions and suspicions in Chile can now be healed somewhat by similar processes of reconciliation as in South Africa after apartheid. Victor’s music and songs are full of the generosity and warmth that could bring about such reconciliation. But South Africa created a Commission for Truth as well as Reconciliation. There has to be a proper understanding of the forces against democracy, within Chile and outside, that killed Victor Jara and his compatriots. Today we see the same arguments for interference in the affairs of other countries, democratic or otherwise, by the US, its corporate elites and its allies. The press highlights what is happening in the Middle East but not in Venezuela and Brazil where international corporate interests backed by the USA make it very difficult for democratic mandates on behalf of the poor to be fulfilled.The life and work of Victor Jara can inspire us to follow his lead and not allow the language of freedom and democracy to be taken over by the same kind of interests that tried to silence him. He helps us to remember the meaning of the other 9/11.